Like him or loathe him, Pope Francis is nothing short of a global social phenomenon. Within the space of less than three years since his election in 2013, Jorge Mario Bergoglio has divided public opinion inside and outside the Catholic Church as have few religious leaders of modern times. For some he is a breath of fresh air and hope for contemporary Christianity, calling the Church and the world back to the radical simplicity of the Gospel. For others he is variously a dangerous heretic, Marxist infiltrator or even the False Prophet of the Book of Revelation. In this book released in November 2015, interdisciplinary researcher Peter Bannister explores these diverse Francises as portrayed by his detractors, both popular and highbrow, that have taken hold in the popular imagination in a climate marked by conspiracy theory, urban legend, purported apocalyptic prophecies and the anarchic world of internet publishing. 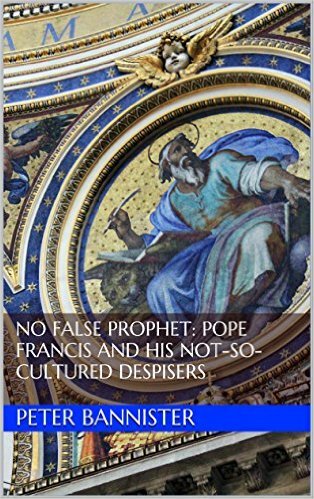 No False Prophet: Pope Francis and his not-so-cultured despisers can be purchased in Kindle format or read for free by KindleUnlimited subscribers by clicking here.